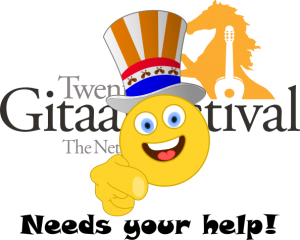 For the first time, the Twents Gitaarfestival will organise a Fingestyle Sologuitar Competion. Since the last decades, a blend of different music genres is presented on stage and studio’s. Cross-over-thinking is widely represented today, shifting borders of styles and conventions of right and wrong. From the belief that free experimenting in music is one of the biggest achievements of our generation, the Fingerstyle-genre combines several musical styles and techniques to a new cross-over genre. Therefore, Twents Gitaarfestival offers the broadly oriented guitarist a chance to present his/her play, achieve recognition from the audience and consequently build a reputation as Fingerstyle Guitarist. The indicated style in the Fingerstyle Sologuitar Competion is free to a large extend, consequently to support participants to develop their personal style outside the mainstream and ‘false’ doctrines. The Fingerstyle Sologuitar Competion is open to amateur-guitarists, conservatory students and professional guitarists of all nationalities. The competition has two rounds, of which the first round requires the participants to submit an audio-file online. From these submissions, our jury will select 5 finalists, who will be announced on Saturday May 18st, via the Twents Guitar Festival – Social Media Platforms. The final will be held at Sunday June 2nd, between 12.00h and 18.00h at the Oude Markt in Enschede. You can sign up from 15 March via the online registration form on our website. You must submit a video of max. 10 minutes free program. You can register until 5 May at the latest. Finals: 15 minutes of free program, of which at least one piece should be in the Merle Travis-picking style. Repeating maximum 10 minutes of the program of the first round is allowed in the finals. Every music genre can be played. For a classical repertoire, we would like to refer to our classical competition (Kaj’s Guitarstore Competition). Use of vocals will not be included in assessment by the jury. Use of loop-systems is not allowed. Only in the finals: At least one piece should be played in the Merle Travis-picking style. Please read the official regulations of the Fingerstyle Solo Guitar Competition. The jury will consist of reputed guitarists and musicians from Europe, specialised in this area.